The Staybridge Suites, my new hotel of choice for GenCon. Our group woke around 7 AM, heading down to the hotel’s continental breakfast, arguably the best part of staying at the Staybridge. 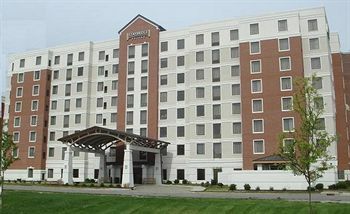 With bellies full, we headed out to the Convention Center where Will broke off to head towards his Armada tournament. 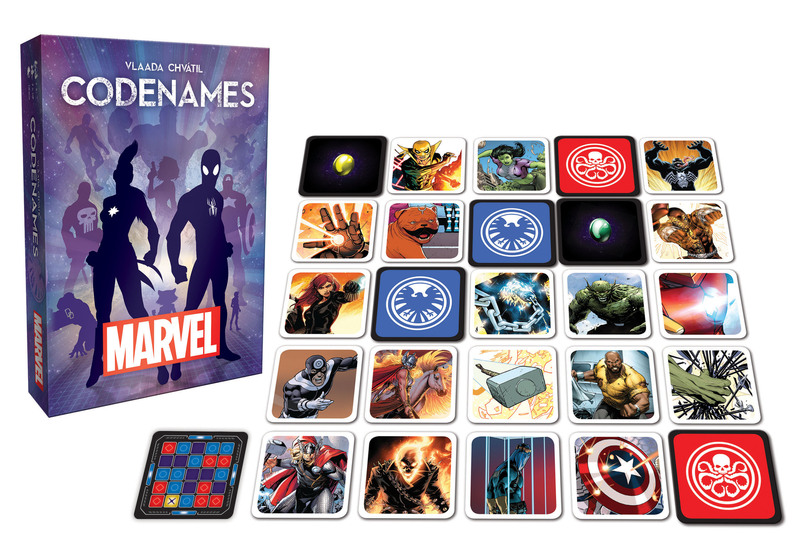 Kevin and I headed to the Czech Games Edition room to demo Codenames: Marvel and Codenames Duet for an hour before the hall doors opened. Marty and Jason headed somewhere, but honestly, let’s get to some reviews! The 2-player version we have all been waiting for – Codenames: Duet is a must-have. 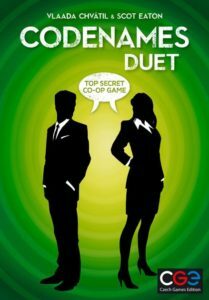 Codenames Duet is an excellent cooperative two player game. It was $20 at the convention and currently $15 on CSI. There is no excuse not to own this game. Both players become spymasters with a double-sided map. There are three assassins on your side, and three on your partner’s side, one of which is shared. You then each have to get the other to guess nine clues, three of which are shared, before you run out of guess tokens. The number of guess tokens sets the difficulty for the game, and replace Bystander tokens. Kevin purchased a copy almost immediately. My copy is sitting in my cart online, waiting for a few other games to reach free shipping. Duet successfully brings the fun of Codenames into a rewarding two player experience. A light caveat: it also has the possibility to end friendships with frustration because your partner does not understand that letters are the most obvious type of paper, not pen and pad, it wasn’t my fault that happened to be the assassin. We’re fine now. Really. Props to you can recognize every character and weapon, I cannot. 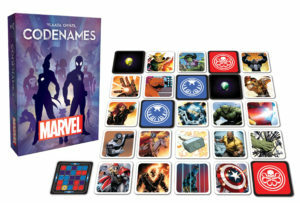 Codenames: Marvel was a completely different animal. If you are a die-hard Marvel comics fan, and can recognize minor characters from a side view of one boot, this game is for you. I am not a huge comic fan (*gasp*) and found the game impenetrable. The cards have a graphic on one side or a word on the other. You choose which side to use, but you cannot look at the back side. The graphics were difficult. All players agreed unanimously the word-only side would be impossible with anyone who was not a huge Marvel junkie. If you are the target demographic, enjoy. I will be happy to never play this game again. After trying Codenames, we headed towards the exhibit hall. The mass of people moved accelerated below us as the doors opened, running to Paizo for Starfinder, or various booths to redeem the handful of free items for early arrivals. What do you call a stampede of nerds? A nerdpede? A geek-herd? Whatever it was, I was definitely part of it. I made my way into the CMON line, quickly into the store, and found a complete absence of Kickstarter exclusives. 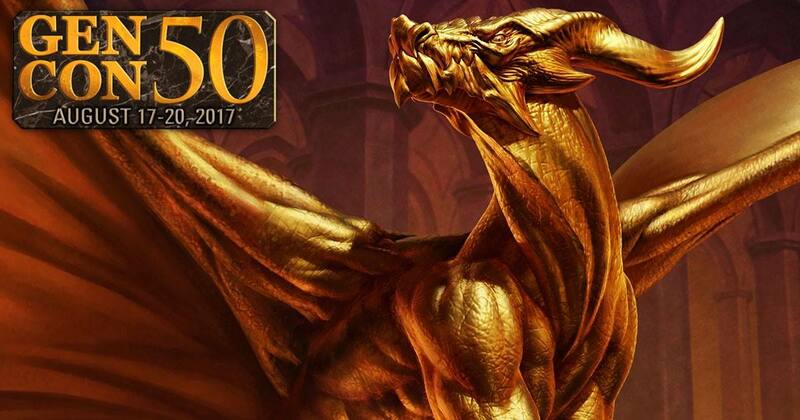 The black hole of emotions that I failed at another GenCon. The indignation rose in my chest. “It’s not even a new release!” I mumbled to no one in particular. I felt the tendrils of nerdgret through my very soul. I had failed. Again. If only there was a cool gimmicky book that combined vampires, secret agents, and conspiracies to make me feel better. Everything an RPG supplement should be. With head hung low, Marty and I made our way to Pelgrane Press. There I found and bought the hidden gem that is Dracula Unredacted. This is a supplement to Kenneth Hite’s Night’s Black Agents RPG, a game in which players assume the role of super spies (Marty reviewed it here). The players have found a modern day vampire conspiracy only a group with special skills can stop. Based on the GUMSHOE system, it is a system that is all about finding the clues and investigating the story. 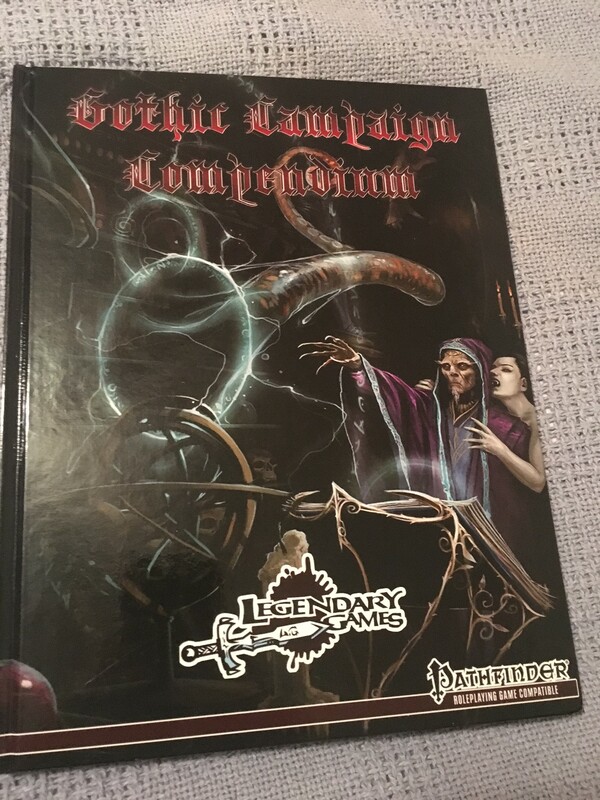 Hite also published the Dracula Dossier Handbook, a campaign book set in this world, providing an extensive backstory for a campaign that I have spent almost a month reading. 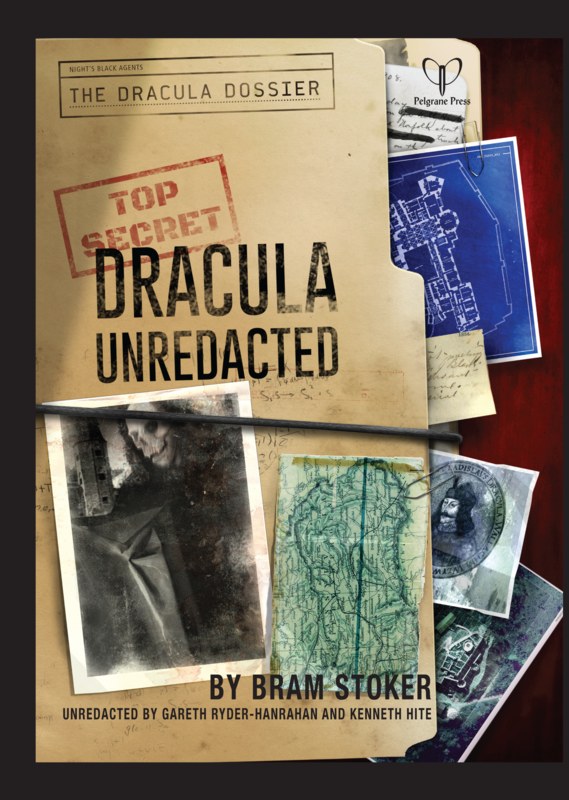 Attached to the campaign is a book called the “Dossier” in the game – an annotated form of Bram Stoker’s classic, Dracula, with notes from three MI6 secret agents in the margins. The book is actually an after-action report about a failed attempt to convert a vampire into a British secret agent. It is weird, quirky, and wonderful, and Kenneth actually made the physical book you can hand your players to find clues, called Dracula Unredacted. Kenneth was there to sign my copy (as Bram Stoker, naturally), and write a short personalized message that will be a functional clue in my game. Pacified (for now), Marty and I headed over to our scheduled events. Marty and I were off to our Shadow of the Demon Lord game, entitled “See the World, They Said.” We started off by choosing pregenerated characters, Marty becoming a Death Priest (sort of a warlock class). Naturally I took the Human Paladin that served the New God of life to directly antagonize him. Our party filled out with melee characters and one Pyromancer. We fought off a small crew of bad guys with purifying fire. Explosions around town lead us to fight a horde of monsters, buying time for citizens to retreat. We slaughtered our enemies, eventually retreating ourselves. Then we snuck toward a “dark light” coming from the now-desecrated temple. Utilizing our Changeling’s abilities we bypassed combat after combat with good wisdom checks. At the Temple, we fought a bunch of cultists and a Beastman-deity that completed a dark ritual to become a demon. Near the end of the combat I had combined several turns’ worth of spells to make an attack that allowed me to roll roughly all of the dice on the table, which was cool. Subsequently, a small attack from another party member ended the battle and the session. It was…fine. The DM kept switching dice when he couldn’t kill us. He was very negative about all of our decisions as players. I liked the system, but the adversarial GM and the lack of investment by some of the other players really soured the experience for me. 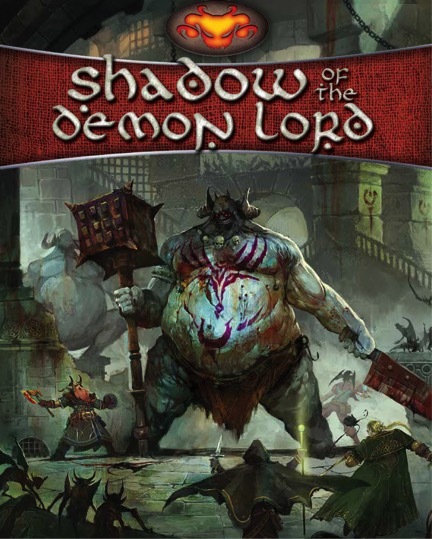 Marty was nearly in tears, as Shadow of the Demon Lord had been his Con-saving game last year. Sorry Marty. 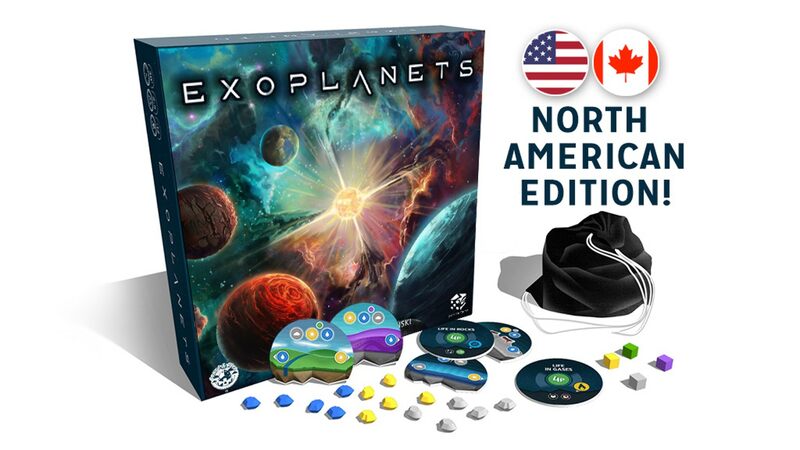 Exoplanets kickstarter version now available in stores. I exited quickly hoping to redeem the day with a demo of Exoplanets in the Greater than Games room. Exoplanets is a very light tile placement game with an area control component. You pick up planet tiles and then place them along one of four pathways leading away from the sun. You gain either water, gas, or solar gems based on where you place tiles. Then you can spend resources to create Life. Once you would place the fourth Life on a tile, you create a Species that scores more points in the end game and kills off all opponents’ Life on that planet. The harder the planet was to create life on, the higher the multiplier on your life or Species’ score. You can also play tiles underneath a planet that has been made for an effect, increasing scores in an orbit, decreasing adjacent scoring tiles, making a planet harder to build life on, etc. The game was fun but made no strong impression. If this ever comes down to the $15 range, I might pick it up, but I felt no pressure to add it to my collection. As I continued down the hall, I encountered the Blue Orange Games booth. The much-hyped Photosynthesis was on full display. The sheer gimmickiness of the large cardboard trees on a strange gridded board with a weird cardboard sun that rotated around the table attracted my interest. The game revolves (pun intended) around keeping your trees in the light. I did not get to play myself, but I highly recommend checking it out if you are like me and enjoy gimmicks. See the Dracula Unredacted section for contex. 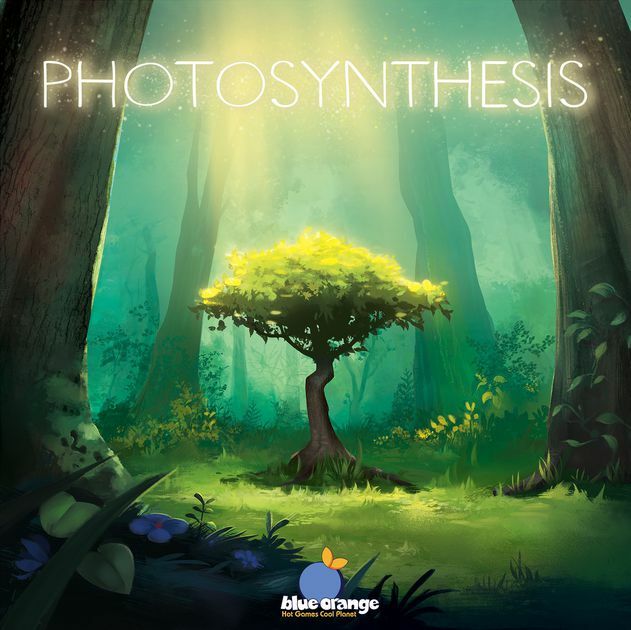 Photosynthesis seemed fairly light weight, but many people claimed it to be more strategic than it looked upon first impression. I did not form a strong impression of the game because of a fateful event. 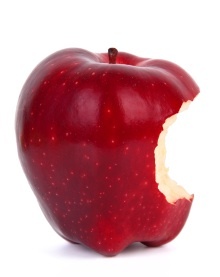 While I was watching, I bit into an apple, as I had no time to stop for lunch. A man walked up to me simultaneously at that moment, observing the game. I now understand why traitorous apples are a trope in fiction. Who was it? None other than the designer of Blood Rage himself, Eric Lang. What do you do when the designer of your favorite game walks up next to you when you are in the middle of chewing a bite of apple? You do nothing. He walks away before you get the chance to say anything. Sigh. 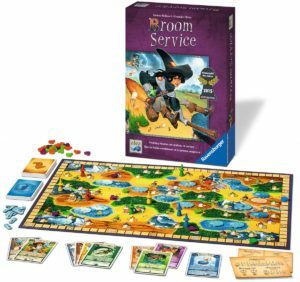 I made my way shamefully to a pre-scheduled Learn to Play of Broom Service. 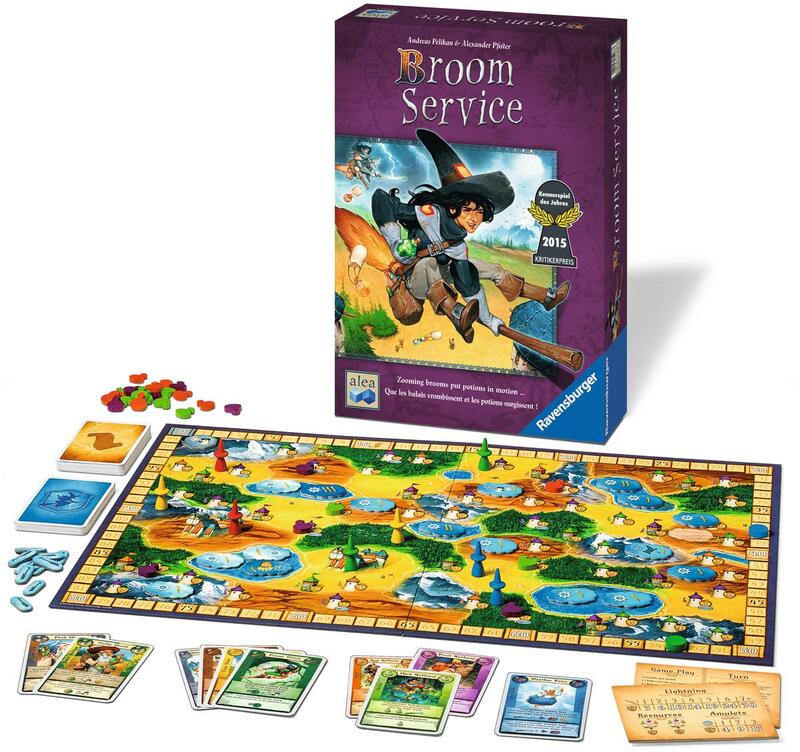 Broom Service is a 2015 game that won the Kennerspiel des Jahres. A family of three, a father and his two preteen children were there, along with the man teaching the game. A surprisingly delightful game from a few years ago. The family and I played while the teacher guided us through the game. You are a witch, represented by two hats of your color, trying to deliver colored potions to various towers for points. For most towers, once you deliver a potion, that tower no longer accepts potions. The towers that are most valuable are at the far edges of the board. You move and deliver by playing cards. You choose a subset of four cards from your ten available in secret. You then play the card for either its cowardly effect – a small but immediate effect, or its brave effect. Everyone after you in the turn must play the same card if they have it. If you chose brave, and someone who goes after you chose brave, your effect is canceled. It becomes a game of resource management and bluffing, while deducing what your opponents are likely to do. It was quite fun, even though I lost by an atrocious margin. I definitely see how it earned its award. 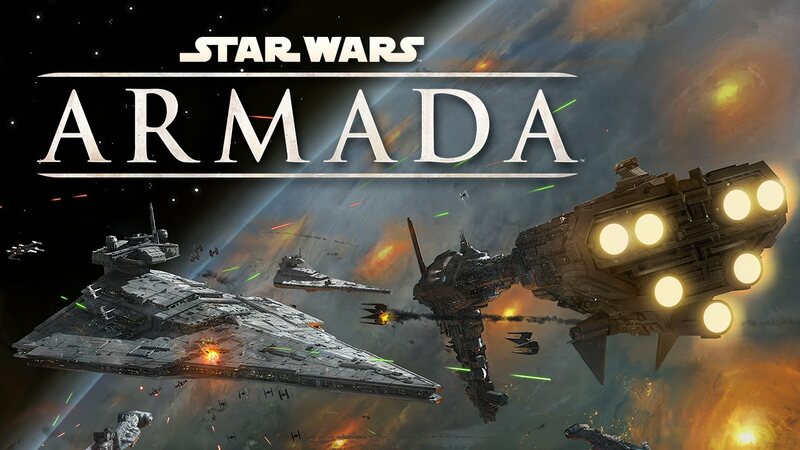 I have been recommending this game to everyone since playing. It is good for gamers, intro level players, and kids. Feeling better, I headed to several podcast panels. 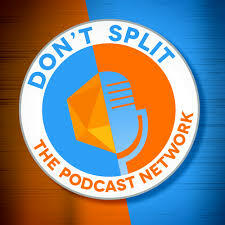 A newcomer, the Don’t Split the Podcast Network had a very small crowd, but their scripted series Have Spellbook, Will Travel is excellent. 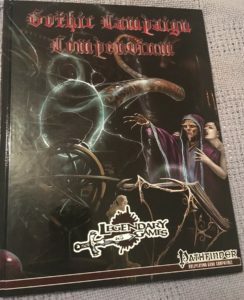 I won a Pathfinder Gothic campaign setting book from Legendary Games while there. I then headed to a larger crowd at the D6 Generation live recording. I eventually acquired some warrior dice, and Kevin’s friend won the copy of Blood Bowl I had my eye on during the session. After the D6G show, I headed to my first tournament of the weekend. I am a competitive player and GenCon was my one chance a year to win something real. 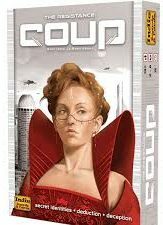 Coup is a great large group filler game from Indie Boards and Cards. It combines social deduction with a random role assignment. You are assigned two roles secretly with different powers. You then take actions based off of the characters you either are or you are pretending to be. It is quick, removing one of the issues with other social deduction games. Our group has played the game a number of times. I felt confident in my abilities heading into the tournament. The Coup tournament almost broke me. I started off well, immediately winning my first game. The tables took the top two players from 14 tables, then the top three from 6 tables, then the top 3 from 2 tables, then the final six played each other. I won my first game at the set of six tables. Then I failed round after round at the two table stage, eventually losing to a player who was forced to play kingmaker. The people playing as the completion grew more intense were less and less fun to talk to between rounds, the environment took on an awkward quality. There was no promo for participating, and no reward for almost making the top table. A lot of wasted time and effort. I was left with a very empty feeling. After the event, I had decided that I would not participate in tournaments next year. I was disappointed by losing, yes. But everyone seemed to have abandoned cordiality in favor of an unhealthy and, at times, down-right hostile environment. I have played tournament Magic before, and this was far worse than that. In fact, it was by far the worst I had felt at the Con. 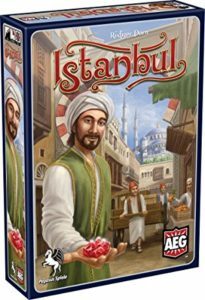 Marty had tried Istanbul the 2014 Eurogame out of AEG. It is an economic game using a grid movement around a modular board that uses a pick-up-and-deliver mechanism to score points. 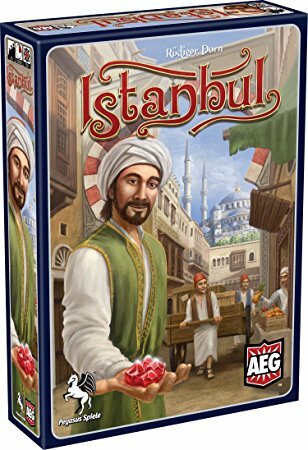 You are playing merchants trying to deliver goods in various sets and expand the carrying capacity of your carts to acquire five red gems before your opponent. The game is probably the lightest a pick-up-and-deliver game can be and a good introduction to the mechanic. The primary concern with the game is its replayability. The game feels solvable, with little to no player interaction. If you are looking for an intermediate level game to introduce your group to before tackling Firefly or Merchant of Venice, this could be a good game to gauge interest in the pick-up-and-deliver mechanism. I went back to the hotel defeated, with a heavy heart. I had signed up for another tournament on Friday, could it be that I wasn’t competitive? Or would it just be better to play games for fun at GenCon? Was it worth spending this much money on a mediocre experience? 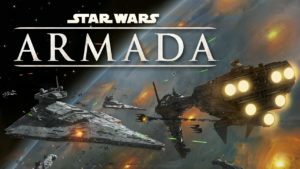 Will finished his Armada tournament late into the night, having played one extra round (approximately three hours each) after the main three. He finished in a respectable 24th place out of about 40 players. And he still won stuff. I wasn’t envious at all. Kevin had run around to events with generic tickets, but had also found a number of free demos as well as exploring the Exhibit Hall. He is an animator and graphic designer, so every indie Kickstarter game received a business card and a conversation. If you, dear reader, are interested, you can contact him through us. Marty also played in a game of The Strange, RPG, a time-traveling detective game, which went awry. His Con RPG luck had struck again with another unsatisfying session. Would Marty ever find a fun RPG at GenCon? I had planned on trying to get into at least two more tournaments over the course of the weekend on generics. Should I just go to the one I had already paid for – the One Night Ultimate Werewolf World Championship, and find something else to do during the others? Would I ever find a way to get the Blood Rage Kickstarter exclusives? Friday was a new day, and it would be the day that would either save or sour my GenCon experience. TL;DR Codenames: Duet, Dracula Unredacted, Broom Service, Istanbul, and the Don’t Split the Podcast Network were good. Shadow of the Demonlord, Codename: Marvel, Exoplanets, meeting Eric Lang, and the Coup tournament were mediocre to bad.